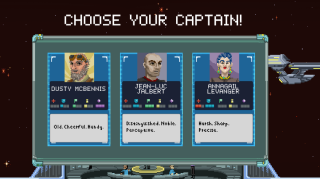 Andy Chalk described Schell Games' Orion Trail as "The Oregon Trail, in space", and I can't think of a better way to put it, so *yoink*. The adventurey survival game featuring, as Chris Livingston put it, "hostile aliens, space pirates, energy beings, dimensional rifts, evil robots, telepathic monsters, and of course, a horrifying array of deadly and disgusting space diseases" was successfully Kickstarted earlier this year, and after a short stint in Early Access, it's just been given a proper release date: October 12. Schell Games says it's "received some great feedback" from the Early Access period, and has acted on it, but reveals that the planned hunting mini-game has been cut. "When we were preparing for the Kickstarter, Hunting was one part of the game that we refused to cut, until it became obvious to us that the money needed with the Hunting mini-game wasn’t going to be realistic to ask for. "So, we were forced to make a tough choice: do we risk the project not getting funded, or do we feel confident enough that the game can be strong enough on its own without shooting at space buffalo? Ultimately, after a lot of discussion, we believed that the game has enough to bring to the table without it, even though it could compromise what it means to be a 'trail' game." Schell are "looking for ways" to try and make skill-based mini-games like hunting a reality, after launch, but it doesn't sound like a sure thing. The devs will be streaming the game today on their Twitch channel, if you're interested.